JERSEY CITY, N.J. –- The local flavor of historic Paulus Hook in downtown Jersey City will be on full display when Fields Development Group hosts the first “VIP Launch Party” event at Madox on Thursday, November 1st from 6 p.m. to 8:30 p.m.
An exciting night of food, drinks and live music is in store for interested prospects who will receive a firsthand look at the well-appointed apartment homes, incredible amenities and eco-friendly design of the eight-story building and dine on culinary delights from popular local restaurants including Satis, Amelia’s, Carlos Bakery (Cake Boss), Goehrigs and more. Tours will commence in the magnificently-decorated model homes which reflect the innovative interior design of Madox. As attendees move through the building they can experience exactly the kind of lifestyle Madox and the neighborhood has to offer. The final stop will be the expansive rooftop terrace where potential renters will enjoy live music and food with beautiful water views serving as a backdrop. Those interested in attending can add their name to the VIP List at Madox by RSVPing at http://madoxvipparty.eventbrite.com or visiting www.madoxapts.com. The Paulus Hook neighborhood is widely considered the most desirable area in downtown Jersey City. Striking a perfect balance of a quiet residential setting with an active urban village, the community boasts charming tree-lined streets dotted with historic brownstones and an eclectic array of local shops and restaurants. Several waterfront marinas border the neighborhood, while nearby Liberty State Park offers a green oasis for active and passive recreation, including miles of walking, biking and jogging paths, endless open space and spectacular views of the Manhattan skyline, Statue of Liberty and Ellis Island. Situated in the heart of Paulus Hook at 198 Van Vorst Street, Madox incorporates all the elements that make the neighborhood a desired residential address. The building features a mix of 131 studio, one- and two-bedroom residences with some one-and two-bedroom homes also featuring additional dens, a significant advantage for young couples looking to grow a family or single professionals hoping to add a roommate without increasing their monthly rents by fully upgrading to a larger size apartment. Initially priced from around the $1,800s, the well-designed residences at Madox will offer from 480 to1,312 square feet of luxury living space, along with a considerable array of high-end amenities and finishes. Found throughout the homes will be custom hardwood floors, 9 foot ceilings, washer/dryer in every home, and master baths with custom vanities and tile. Gourmet kitchens will feature custom 42” cabinetry, stainless steel appliances, gas cooking, Caesarstone countertops, tile floor and backsplash, and designer lighting and fixtures. While the homes are certainly a major draw, Madox will also offer a close-knit, family-friendly environment created by on-site amenities and services that reflect the building’s uniqueness and intimacy. Residents will enjoy a keyless entry system, 24-hour doorman, state-of-the art gym, a lobby lounge with a library, business center and communal technology table with iPad Station, iMac and PC; and a residents’-only lounge with children’s play area, yoga room, kitchenette, two TVs and more. The abundance of outdoor space is sure to create a community-oriented lifestyle with a landscaped courtyard with outdoor children’s play area, café seating and benches, two common 8th floor terraces and common roof deck with hammocks, natural gas fired BBQ, fire pit, lounges for sun bathing and magnificent views of NYC, Marina, Statue of Liberty. Valet garage parking and bicycle storage will also be available. “Madox will offer a unique blend of artistic living and common spaces, exciting indoor and outdoor amenities and responsible development practices that will inspire people to set down roots here,” Mr. Caulfield says. 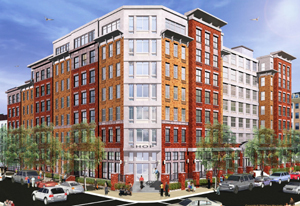 What’s more, Madox is on schedule to earn the first LEED certification for a residential building in Jersey City. The building is being built in accordance with U.S. Green Building Council guidelines for developing high-performance, sustainable buildings which incorporate responsible site development, energy efficient design and sustainable materials to create environmentally-sensitive urban living environments. Green elements being incorporated into Madox include a PV Solar Array and vegetation on the roof, electric car charging stations, and systems to reduce water consumption by over 45% and energy consumption by 14%. The building will also be under contract for at least two years to provide 35% of its electricity from renewable sources. Madox will also boast a 100% smoke-free environment, a unique lifestyle feature that is one of the first of its kind in New Jersey and a rarity in the New York Metropolitan market. Based in Hoboken, NJ, Fields Development Group is a third generation real estate developer with a building heritage that dates back to 1933. Specialists in urban development since its beginnings, the company is widely recognized for its unique ability to create signature residential buildings that combine dramatic urban living spaces with modern amenities and features. Notable projects by Fields Development Group in Hudson County include Saffron, Waldo Lofts and Ivy House in Jersey City and Fields Crossing in Hoboken. www.fieldsdevelopment.com. Led by brothers James and Robert Caulfield, Fields Development Group’s homebuilding expertise encompasses the entire spectrum of housing product, from land acquisition and construction to sales and marketing. All aspects of development are handled in-house to ensure an unmatched level of quality value and customer satisfaction. Check out the Cooking Classes at the Culinary Conference Center! Jersey City street artist will debut a balloon in this year’s Macy’s Thanksgiving Day Parade!